The Faber® Bridge – the best replacement bridges you can buy today! “Rattle Free” by design, with a wide choice of finishes and removable saddle types, including titanium! Faber® has the perfect bridge for you! Pre-notched (“starter notches”) saddles in nickel plated brass, or unplated natural brass are standard. Now, as an option, you can order your Faber® Bridge with titanium saddles or in HYBRIDge™ configuration (3 brass/3 titanium saddles). In addition, NO NOTCH saddles can be added as an option. See below for further details. Perhaps the most vintage correct replacement bridge available on the market today! Flat top saddles provide tight, 100% mechanical contact in the ABR frame. Available in various finishes and saddle types. Nickel plated bridges have choice of nickel plated brass, natural brass, or titanium saddles. Gold plated bridges have polished natural brass or titanium saddles. Saddles (natural, nickel plated or titanium) have starter notches dead center. Removable saddles, allows for changing orientation, if necessary, for perfect intonation. 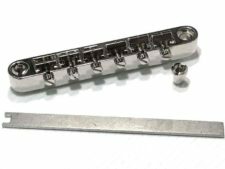 Three models are available: ABRH for original ABR-1 bridge posts; ABRN for original Gibson® Nashville or Heritage Schaller posts, in most cases; ABRM for 4MM import posts. 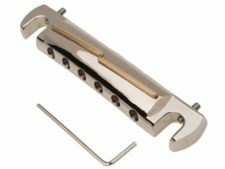 TIP: If you are replacing your Gibson Nashville bridge, Heritage Schaller bridge, or Epiphone/Import bridge (non 4mm post type), you will need conversion bridge posts. 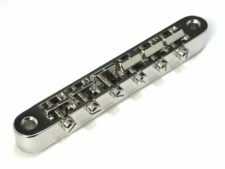 Our exclusive “No Gap” technology is also available in our Tone-Lock™ Bridge. Light years ahead of the usual “set screw” method of locking a bridge to the studs, one look at our system will show it’s design superiority and how it actually can increase sustain. With our system, you won’t damage your bridge post’s threads – a common occurrence with the set screw method. The Tone-Lock™ Bridge, just like our non-locking ABR-59 bridges, features removable saddles. Standard saddles have starter notches dead center, but optional saddles without notches are available. Models available for virtually any electric guitar! Choose the category for your particular guitar for all details. Introducing another Faber® exclusive – the HYBRIDge™ Option. Faber® innovation meets tradition by combining titanium saddles for the wound strings, and brass for the plain strings. Using titanium gets rids of the muddiness that can sometimes occur on the lower strings. Combined with the warmth of traditional brass saddles for the plain strings, the HYBRIDge™ creates a more balanced, focused tone for your guitar! Available as an option on all Faber® bridges. The HYBRIDge™ is used exclusively on the premium Corsa Manalishi guitars. Many sound clips of the HYBRIDge™ can be heard on the Corsa Guitars website. Faber® Wraparound Bridges. Original, compensated, and individually adjustable saddle styles. For left handed guitars, too!